View More In Router Parts & Accessories. This is the companion to the bench top edgebander and edgebanding trimmer. Anyone who has used edgebanding will know how difficult it is to get a perfectly trimmed end. 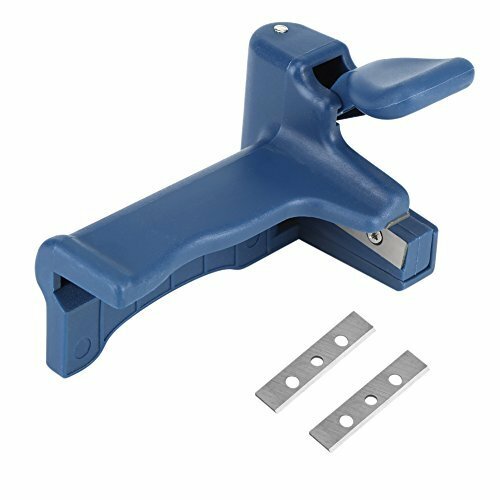 With this tool a single press down on the handle operates the blades in a shearing action. The blades are reversible so when the cutting blade becomes dull simply change places with the anvil blade. The end trimmer cuts banding or veneer up to 0.5mm thick with a maximum cutting width of 54mm. Leaves a perfectly trimmed end for you. It is the great companion to the bench top edgebander and edgebanding trimmer. Clean cutting shearing action. The end trimmer cuts banding or veneer up to 0.5mm thick, with a maximum cutting width 54 mm wide. If you have any questions about this product by Yosoo, contact us by completing and submitting the form below. If you are looking for a specif part number, please include it with your message.